iPhone 5S: Should Apple Compete in the Megapixel Race? Schiller’s statement regarding the iPhone 5S camera is the second reference to Apple’s competitors in the smartphone race that Schiller makes in the iPhone presentation. The first reference he makes is when he says that the iPhone 5C is PVC-free “and Android-free,” to the laughter of the audience. In any case, Apple’s iPhone 5S shows us some new steps Apple has taken to produce a better camera for expensive iPhone users. First, Apple decided to create a five-element lens for the camera, while increasing the aperture from f/2.4 to f/2.2. The purpose of increasing the aperture is to allow more light into the photo (helps particularly in low-light situations). The sensor area was given an extra 15% of space in size so as to allow more detail into iPhone 5S photos. Finally, Apple decided to increase the size of the iPhone 5S camera pixels so as to create sharp, clear images that will dazzle iPhone 5S users. Is Apple’s decision to increase its pixel size a better decision than that of its competitors (to increase megapixels)? “Megapixels” is a term that refers to the number of pixels packed into a camera. The term “megapixels” is actually a unit regarding photo resolution that refers to the number of pixels you can find in each photo you take on your smartphone camera. “Megapixels,” similar to “megabits” or “megabytes,” refers to “one million pixels,” so your 1-megapixel photo contains 1 million pixels in it. An 8-megapixel (or MP, for short) photo from the iPhone 5S would contain, thus, 8 million pixels. Is the More-Megapixel Mindset Something of a Myth? Does Pixel Size Increase Lead to Better Photos? “Megapixels” is a term that refers to the number of pixels packed into acamera. The term “megapixels” is actually a unit regarding photo resolution that refers to the number of pixels you can find in each photo you take on your smartphone camera. “Megapixels,” similar to “megabits” or “megabytes,” refers to “one million pixels,” so your 1-megapixel photo contains 1 million pixels in it. An 8-megapixel (or MP, for short) photo from the iPhone 5S would contain, thus, 8 million pixels. According to CNET’s own Jessica Dolcourt, the idea that more megapixels necessitates a better camera experience is misguided. In other words, you can have a 20.7MP camera (such as with Sony’s new Xperia Z1) and still have inferior photos when you compare the 20.7MP camera to, say, an 8MP camera. In other words, the megapixels don’t make the photo. When you think of an 8MP camera versus a 13MP camera, which do you deem to be the best? In the minds of most individuals, according to Dolcourt, the higher number is the better number. In this train of thought, the 13MP would outweigh the 8MP in the minds of most consumers. This mindset is similar to those who view one screen resolution (say, a 1920x 1080p) as better than a 1280 x 720. Even when the screen resolution is better, the option to increase or decrease your screen’s brightness level is as necessary as screen resolution to enhance your overall experience with the mobile device. Screen resolution, like more megapixels, is not everything. It may be the case that the more-megapixel mindset (as I have coined it here) doesn’t necessitate better photos, but I’ve not found a 13MP camera, for instance, that doesn’t shoot better photos than an 8MP camera smartphone. If you have, please give me some examples in the comments. For now, I will go out on a limb and say that Dolcourt’s claim (although true) is more of the exception rather than the norm. In most cases, packing on the megapixels will do more to enhance photos than maintaining the same camera dimension each year. According to Schiller, Apple retained the same 8MP camera in the iPhone 5S because “we know a secret: bigger pixels equals a better picture.” Is this necessarily the case? I think Schiller is not being entirely honest here. After all, if this is the case, why didn’t Apple act in the same manner over the last three years? The iPhone 5S’s 8MP camera has remained the same with the iPhone 5 and iPhone 4S. The iPhone 4 had a 5MP camera, and the iPhone 3GS had a 3MP camera. Thus, we’ve seen a megapixel-bump with Apple’s iPhone three times over the last four years. 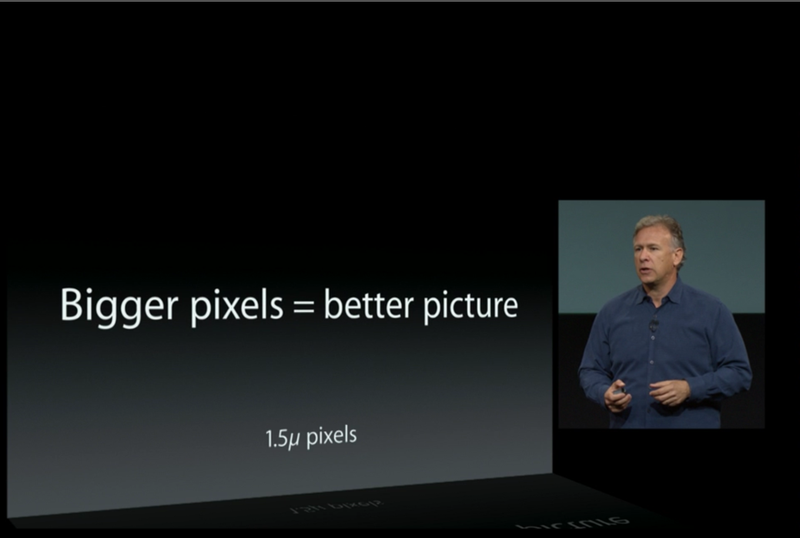 None of this was necessary if Apple could have simply increased the size of its pixels. Did Apple just learn this “secret,” or has the company known it over the last four years? I think there’s a more practical reason as to why Apple increased its pixel size instead of packing on more pixels: to maintain the thinness and lightness of the iPhone 5S from that of the iPhone 5. After all, to pack more megapixels would mean increasing the size of the camera and that of the iPhone 5S itself. Apple didn’t want to create a heavier phone than the iPhone 5, so it went with an alternative route to improve photo resolution. The iPhone 5S is the very first Apple iPhone to increase the size of the pixels themselves. Schiller announced in the iPhone 5S presentation that Apple used 1.5-micron-size pixels in its iPhone 5S camera – a bump up from the 1.75-micron-size pixels Apple used in the iPhone 4. While Schiller claims that bigger pixels creates a better picture (and that this is a better approach than packing megapixels), this approach does not necessarily ensure better photos, either. There is a good example of this with which many may be familiar. HTC’s HTC One provides a camera that has an “ultra-megapixel” (or UMP) experience. To achieve ultra-megapixels, HTC decided to increase the size of its pixels, rather than pack on more and more pixels into its 13MP camera. The result of HTC’s work is that, unfortunately, even Samsung’s Galaxy S4 (which doesn’t use true 1080p resolution, according to Motorola engineer Iqbal Arshad), takes better photos outdoors than the HTC One. The HTC One’s brilliance shines indoors, where the HTC One more than defeats the GS4 in low-light settings. Apple may be after achieving perfection indoors, but pixel-size increase still does not eliminate the outdoor photo problem. It takes more than increasing pixel size and packing megapixels to create a better camera and ensure excellent photos. Apple’s actions prove my point: Apple took its iPhone 5S 8MP camera and added a dual LED flash to it, while increasing the sensor area as well as the aperture. By transforming all of the camera experience (not just the pixel size), Apple proved that it takes more than pixels to produce remarkable photos. While I had hoped for a 13MP camera in the iPhone 5S this year, iPhone users will be pleased. Should Apple compete in the megapixel race? Yes, but you need not expect it until 2014 – when a 4.3 to 4.5-inch iPhone makes its way to market.